Nick Martinelli came to Chicopee Gardens following a hospitalization stemming from a recent fall. The accident resulted in a severe hip fracture requiring surgical repair and which was the primary source of pain and limited mobility. Nick also experienced respiratory failure/pneumonia when in the hospital and has a history of advanced COPD; requiring supplemental oxygen and inhaled medications. Our PT and OT teams were tasked with strengthening Nick’s upper and lower body while our Pulmonary team worked with Nick to practice and ultimately master effective compensatory breathing techniques to reduce his shortness of breath. He was the first resident to benefit from the newly launched Pulmonary Plus program. He was monitored and treated by an specialized team, including a respiratory therapist and a board certified pulmonologist. 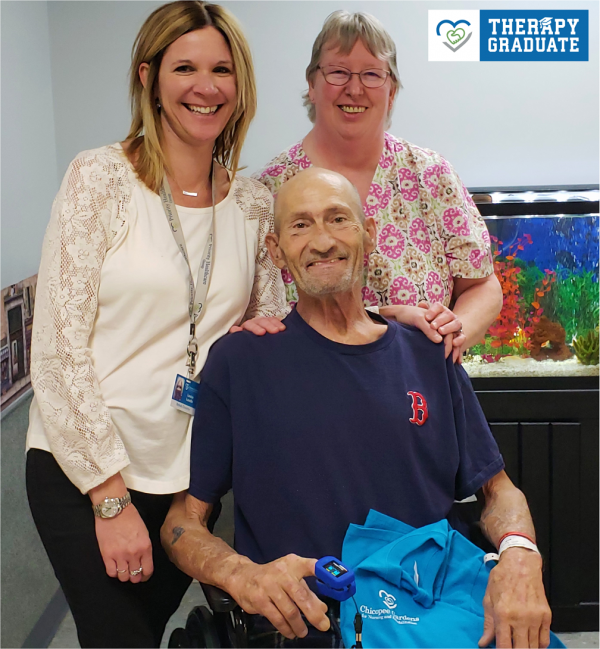 In less than a month, Nick demonstrated the ability to walk around the facility as well as climbing stairs with our therapists and requiring less overall assistance with his self-care needs. In addition, Nick was able to wean off oxygen assistance requiring only supplemental oxygen with exertion and at night while asleep.